Hi! I'm Heidi--I'm a modern-day homesteader starting out in middle age! I'm all about plant medicine, raising animals for love & food, preparedness, traditional food practices, and being a natural health rebel for life! Join me on this journey! I'm Heidi, and this is Ranger. He has been with me for over ten years, and I love him dearly. I made a bunch of home made apple sauce in the crock pot about a week ago--delicious cinnamon apple sauce! I can get about two good quarts of apple sauce when I make it in my crock pot, and that's not really enough to can. So, I ended up putting those quart jars in the 'fridge, thinking Mr. V. would eat one, and I'd cook with the other one! But----I forgot all about them! Have you ever done that? When I found them chilling there in the fridge yesterday, I realized I had to do something with them right away or risk them going bad. 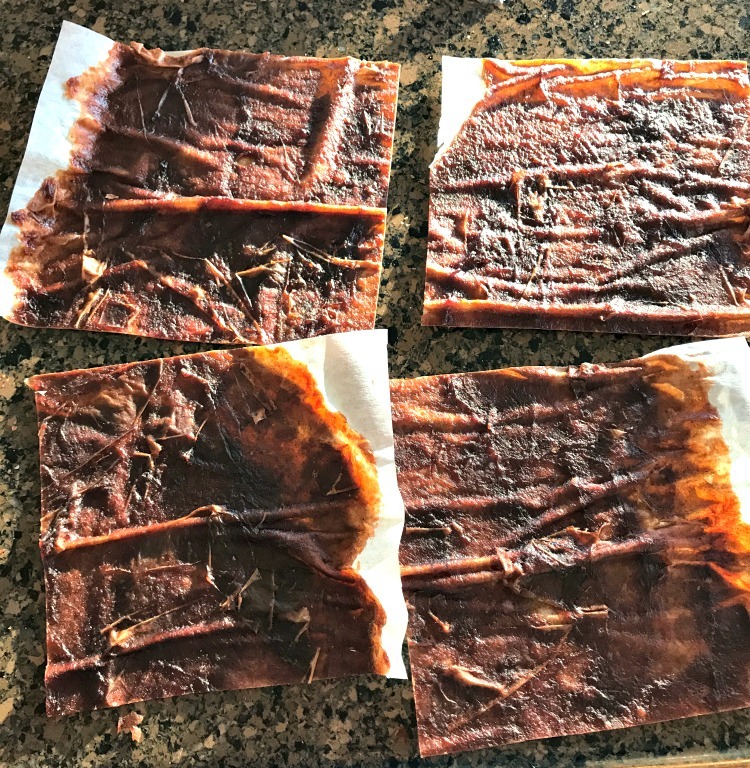 I decided to make some apple fruit leather to preserve that apple sauce! Here's how I made super easy apple fruit roll-ups! You can use apple sauce from the store to make your fruit leather, but home made is just always better. If you want to keep your fruit leather as healthy and natural as possible (and don't we all? ), then be sure to buy unsweetened apple sauce, and preferably organic. Do you have apple sauce you need to use up? OR...maybe you just want to make a natural healthy snack your kids will love? 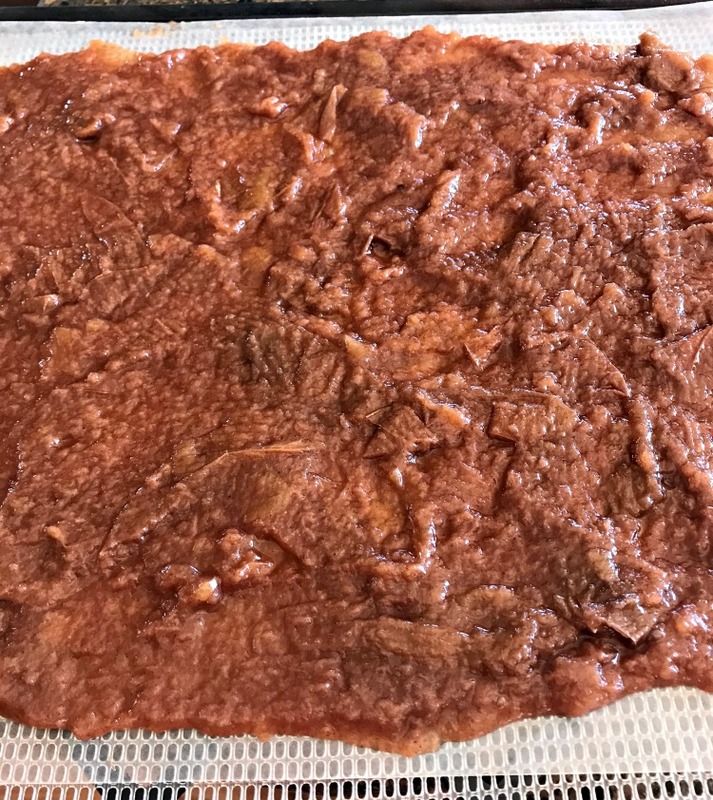 Here's a recipe and directions for how to make the perfect apple fruit leather from apple sauce! Find out how to make apple fruit roll-ups--the perfect snack for kids and grown ups too. You'll want to spread your apple sauce onto parchment paper or another smooth surface that works for dehydrators. Spread it out as evenly as you can about 1/4 inch thick. I didn't spread mine quite that thick, and next time, I'll add a bit more to make a thicker leather. HERE'S A MISTAKE I MADE---DON'T DO THIS! Well, I ran out of parchment paper right in the middle of getting my dehydrator trays ready. The regular dehydrator sheets have holes in them, so I couldn't use those by themselves or I'd end up with a big mess in my dehydrator. You can buy special flat dehydrator sheets, but I'm too frugal for that right now. Parchment paper works fine! So I did what most people would do: I Googled what else I could use! Wax paper came up as an option, and I happened to have that--and here's what happened. Here's the apple sauce spread on the parchment paper on top of one of the dehydrator trays. I have an Excalibur dehydrator, and I just love it! It's the best one I've ever had! I set the temperature to 135 degrees, turned it on, and the fruit leather was done in about eight hours. If I had spread it thicker (about 1/4 inch or so as I will do next time), it may have taken up to another four hours or so. Gorgeous apple fruit leather before being cut. Once your fruit leather is completely dehydrated (not sticky, and removes easily from the parchment paper), it's time to cut it up and roll it for later. I cut off the really uneven edges, then cut each square into fourths. Since I was still out of parchment paper, I just used the paper that I dehydrated the leather on. This wasn't ideal, as it was a tad "crispy," but it ended up working out fine for now. Otherwise, for prettier fruit leather rolls, I would have cut a special sheet of the parchment paper for them. I used a rustic cloth tape to secure the rolls, but you could use anything---even twine would look really cool. I cut these into fourths, but if I had spread the apple sauce thicker, I probably would have cut them into smaller rolls. Perhaps you don't have a dehydrator? No problem! You can use your oven to dehydrate most things too. I haven't actually made fruit leather in an oven, but if I were to do it this way, here's how I'd go about it. Get your apple sauce spread on the parchment paper. I would definitely make sure it's about 1/4 inch thick for the oven, as the oven is hotter than the dehydrator--and you don't want crispy leather. Set your oven to the absolute lowest temperature. For many ovens, that's 175 to 200 degrees. Set the parchment paper directly on a rack because that will allow more air flow to the fruit leather's bottom. You won't need as much time in the oven because it's hotter, so I'd start checking it after a couple of hours. It should be completely dry and easily peel off the parchment paper without being "crunchy." If your fruit leather becomes crispy, you've let it go too long. Your fruit leather will be warmer coming from the oven, so allow it to cool down. Then just follow the above directions! I'm glad I thought to do this! I hate waste, and looking at those two beautiful quart jars and thinking about all the lovely fresh apples from our trees that went into them was starting to make me feel sad. So this was a great successful experiment with a happy ending! I think Mr. V. will enjoy eating these as much as he would have the apple sauce too. They are a perfect, healthy snack! As far as storage goes: I'll be keeping these in a glass Mason jar in the store room. But....I don't think they're going to last very long! By the way, here is a link to my most favorite dehydrator cook book! Do you make fruit leathers? I'll be doing more experiments with other kinds of fruit after this! I was really happy about the way they turned out. If you've tried making your own, or have thoughts or questions, I'd love for you to share by leaving a comment! P.S. If you haven't already, I hope you'll consider signing up for our newsletter! I'll be sending you some eBooks to enjoy too! Get the Newsletter and eBooks! This article was shared on The Homestead Blog Hop, To Grandma's House We Go, and the Homestead Bloggers Network. Heidi Villegas believes that anyone can homestead anywhere and that it’s all about your mindset. She teaches and writes about simple self-reliance topics & skills on her website, Healing Harvest Homestead. Heidi is a community herbalist in the Western tradition and has attended three different herbalism schools for a broad range of instruction. She is also a great advocate of experience & self-study. Heidi is a member of the AHG (American Herbalists Guild) and is currently finishing her coursework for certification in clinical aromatherapy. Heidi resides in the Idaho panhandle with her husband, Mr. V. and lots of animal friends. Join her on Instagram, Facebook, and Pinterest to find out more! Click HERE and learn everything you need to know to make beautiful, handmade, natural hot process soaps with confidence! Click to see my eBook, Herbal Salves, Butters, Oils, & Balms—Easy beauty and medicinal salves to make! Find out how to make your own soap in a crock pot in 12 easy steps—-plus a Citrus Dream recipe! Most popular: Go Green on Your Homestead & Save Money Doing It! Get your foraging shirt! Available in long sleeve, tanks, and regular T’s. Nov 13 How to Make Homemade Fermented Ketchup (Or is It Catsup?) Delicious, Easy, and Filled With Probiotics! Don't forget to SIGN UP for our Weekly Newsletter so you Never Miss a Thing! When you do, you get immediate access to the Free Resource Library that is filled with eBooks, checklists, guides, and lots more on homesteading and self-reliance topics! You can unsubscribe at any time, and your privacy is always safe. Just CLICK HERE! Disclosure: We are a participant in the Amazon Services LLC Associates Program, an affiliate advertising program designed to provide a means for us to earn fees by linking to Amazon.com and affiliated sites. I may earn money or products from any of the companies mentioned in this post. I only recommend products and services I trust to serve you. Purchasing through an affiliate link comes at no extra cost to you. You can learn more Here. Need the Password for the Resource Library and want to get the weekly newsletter? Click Here.